The North Carolina Botanical Garden traces its roots all the way back to 1903. UNC botany Professor William Chambers Coker designated an area in the center of campus for planting bushes and trees (the site of those initial plantings is now known as Coker Arboretum, and is now a popular site for weddings). Five decades later, 70 acres of nearby forest were allocated by the university’s trustees to be developed into a botanical garden. Expansion continued into the 1960s, with another 103 acres donated by William Lanier Hunt. Today, the gardens span nearly 600 combined acres in Chapel Hill. More recently, the James and Delight Allen Education Center was dedicated in 2009. 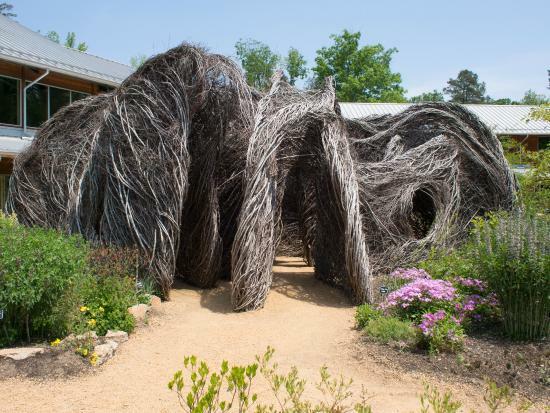 Visitors to the center can enjoy lectures and workshops, and learn about sustainable gardening practices, and the gardens and natural areas in the North Carolina Botanical Gardens. The center includes 2,500 species of plants, and houses natural areas and greenhouses for study of native plant biology, birds and insects, and more. The Frank-Harmon designed building is also the first state-owned building in North Carolina to obtain LEED Platinum certification. Guided tours are offered the first Saturday of every month at 10:00 a.m., and trails are open daily from dawn to dusk. Admission to the gardens is free, but donations are accepted.